Bedford Blues will be turning pink once more as they host the Newport Gwent Dragons Premiership Select side in the British & Irish Cup on Saturday, with the match also this year’s Ladies Day fixture. The Ladies Day match will be supporting Cancer Research UK once again and on top of two-for-one ground entry for all ladies, available on the match day gate only, there will be a host of offers available in the Blues Marquee. Mike Rayer’s men head into the first round of the cup off the back of two Championship victories over Richmond and Rotherham and will be hoping to carry this momentum forward. 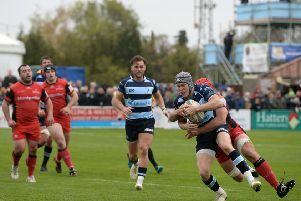 Bedford make numerous of changes from the team that defeated Rotherham last Friday and also welcome new signing Byron Hodges into the match day squad after the former Sydney Stars lock completed a successful trial with the Blues. Not only does the 24-year-old give the Blues a powerful extra option in the second row, he is also a proficient kicker who took on kicking duties while playing in Australia. Elliot Clement-Hill, George Perkins, Tom Griffiths, Myles Dorrian and Tom Whitely all start in the backs while Camilo Parilli-Ocampo, Sam James, Christian Judge, Will Carrick-Smith and Jason Hill come into the pack. Blues: 15. Elliot Clement-Hill; 14. George Perkins; 13. Michael Le Bourgeois (c); 12. Tom Griffiths; 11. Dean Adamson; 10. Myles Dorrian; 9. Tom Whiteley; 1. Camilo Parilli-Ocampo; 2. Sam James; 3. Christian Judge; 4. Mike Howard; 5. Will Carrick-Smith; 6. Ed Taylor; 7. Josh Buggea; 8. Jason Hill. Replacements: 16. George Edgson; 17. Hayden Thompson-Stringer; 18. Billy Walker; 19. Byron Hodge; 20. Justin Blanchet; 21. Jordan Burns; 22. Jake Sharp.